Publisher: Ehapa Verlag, Stuttgart & Egmont AG, Illnau. We have three publishers printing the Swiss-German dialect of Bern. 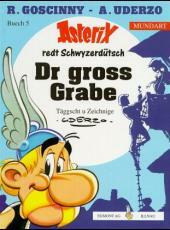 Ehapa (in its Mundart series) has 'Schwyzerdütsch' on the cover, 'Bärndütsch' inside. Ehapa has the same translator (Hansruedi Lerch) as the Dargaud book below.